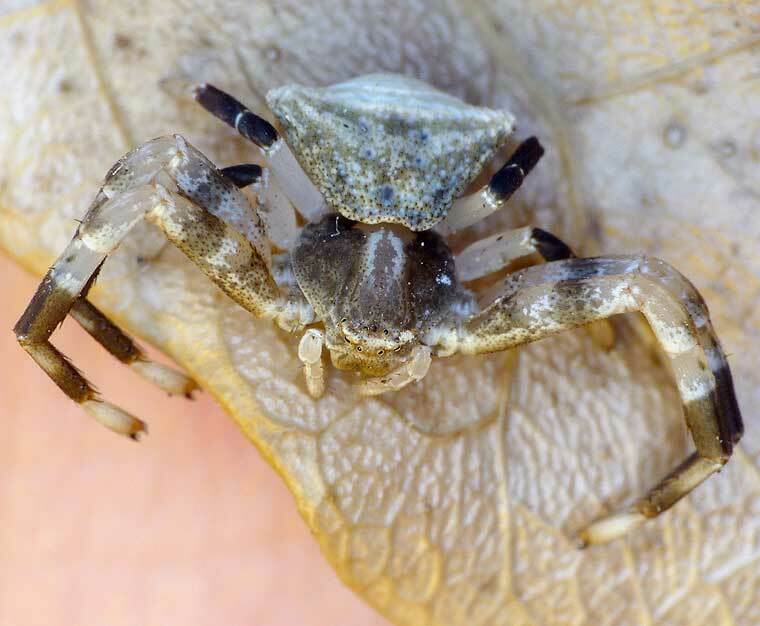 Crab spiders, some also known as flower spiders, are daytime ambush hunters, common throughout Australia in most habitats, but more common in tropical and subtropical areas. Most have laterigrade legs, capable of moving sideways like a crab. They are nearly always camouflaged. Some can change colour to match flowers. Three Australian subfamilies are Stephanopinae, Thomisinae and Bominae. Stephanopinae are drab coloured, cryptic on bark. Thomisinae lack true claw tufts and have only weak cheliceral teeth. They have eight eyes arranged in two rows of four, which they can rotate independently of each other, often surrounded by white pigment and raised on small knobs or tubercles. 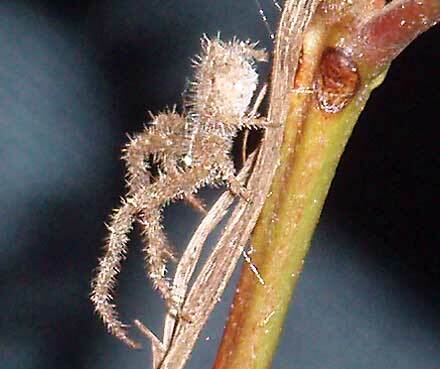 Bominae are tiny to small spiders without strong spines on the front legs and eyes in three rows, 2 2 4. 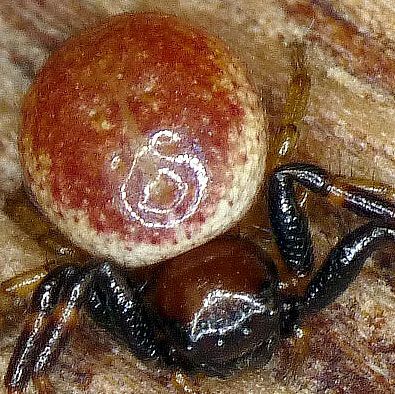 Perhaps the two most noticed Thomisids are Lehtinelagia evanida the Flower Spider and Thomisus spectabilis, the White Crab Spider. 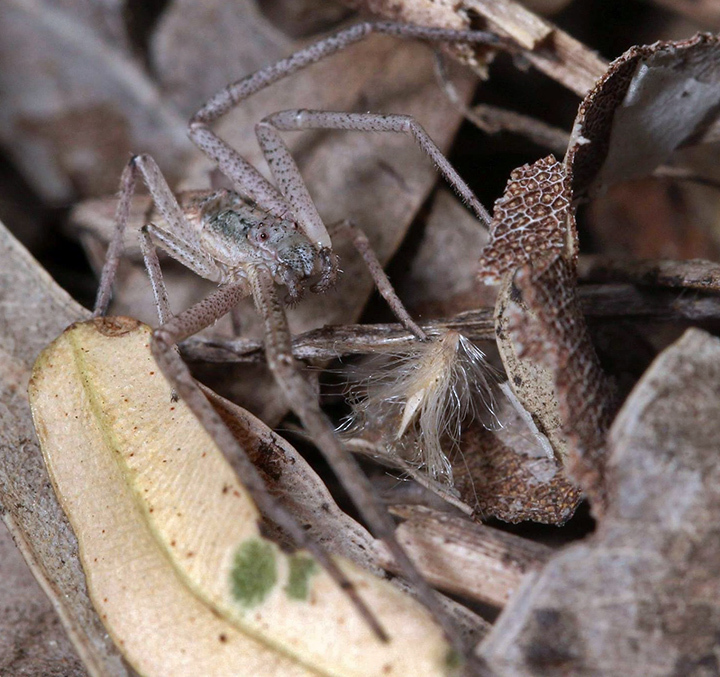 This specimen resembles Cymbacha saucia in most respects, the legs have transparent femurs, the upper surface of the abdomen has the saucia-like pattern, but the upper surface of the cephalothorax, or caput, does not look like Cymbachia saucia. Possibly Cymbacha festiva. 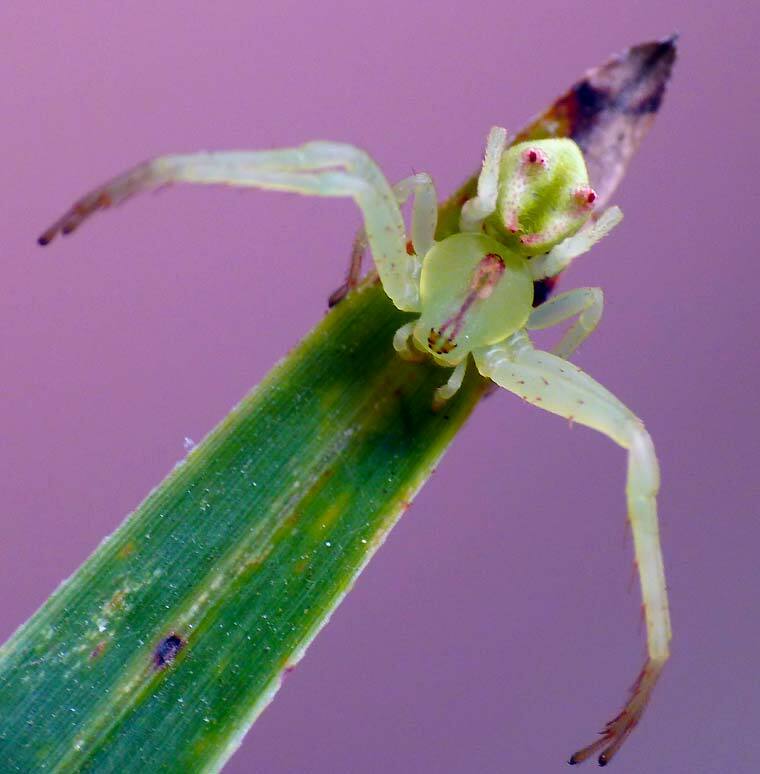 A Thomisid spider found on green leaves or in flowers but spends most of its time in a retreat made by folding the end of a leaf into a bell-shaped tent. The carapace and abdomen are somewhat roughened whereas the similar Cymbacha saucia has a smooth exterior with more obvious patterns. 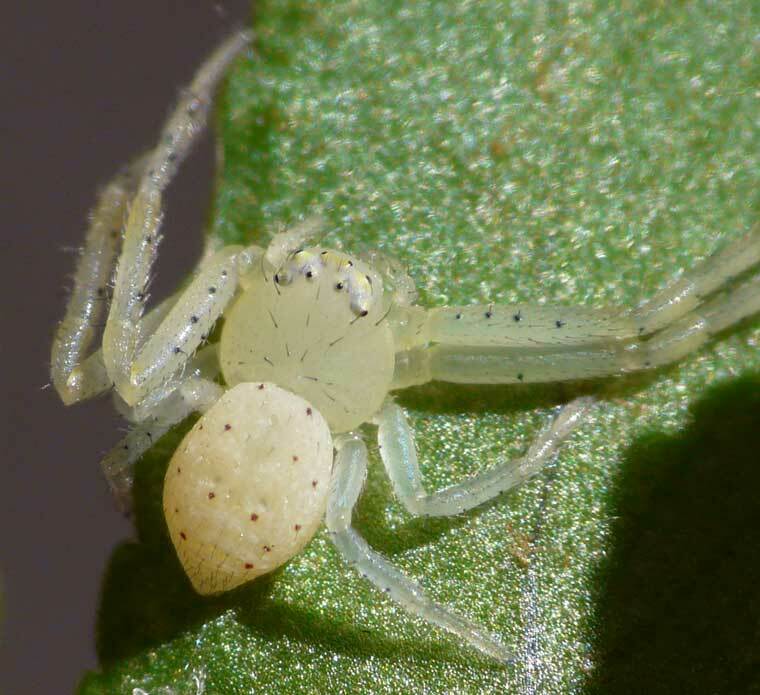 A small crab spider, the male body length 2-3mm, female 4-5mm legs I and II dark, the remainder transparent. 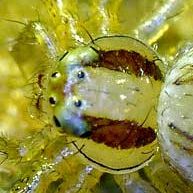 Large cephalothorax in the male, relative to the abdomen.Typical Thomisid bulging eyes ringed with white, the carapace pale in the centre dark at the edges. Reasonably obvious large spiny hairs on the tibia. Lehtinelagia sp. nov. "Stripy C" plus "Pseudocetratus"
Dr Pawel Szymkowiak has provisionally called this species sp. nov. C based on specimens at the Australian collected from Mareeba North Queensland. 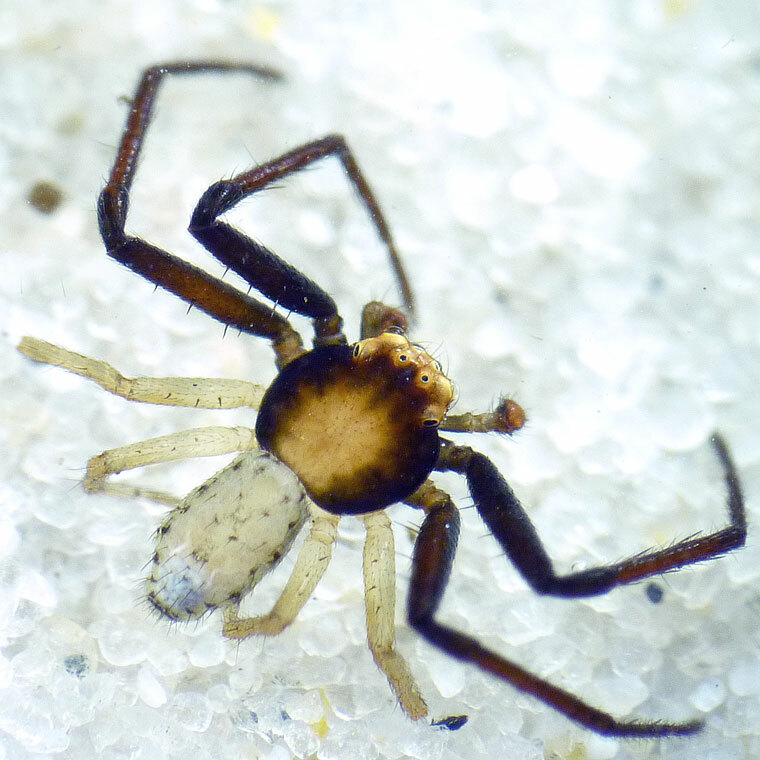 It is a tiny Thomisid, body length about 3mm. It has since been found in many places up and down the Queensland and NSW coasts and hinterland. 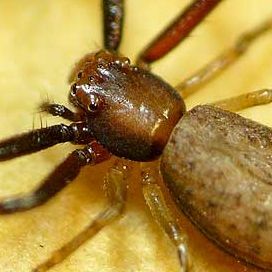 A distinctive genus characterized by a long narrow body, where the abdomen in most species extends beyond the spinnerets in a tail like extension. This Sidymella is rather like S. trapezia and S. longipes, with a rather strongly patterned cephalothorax. 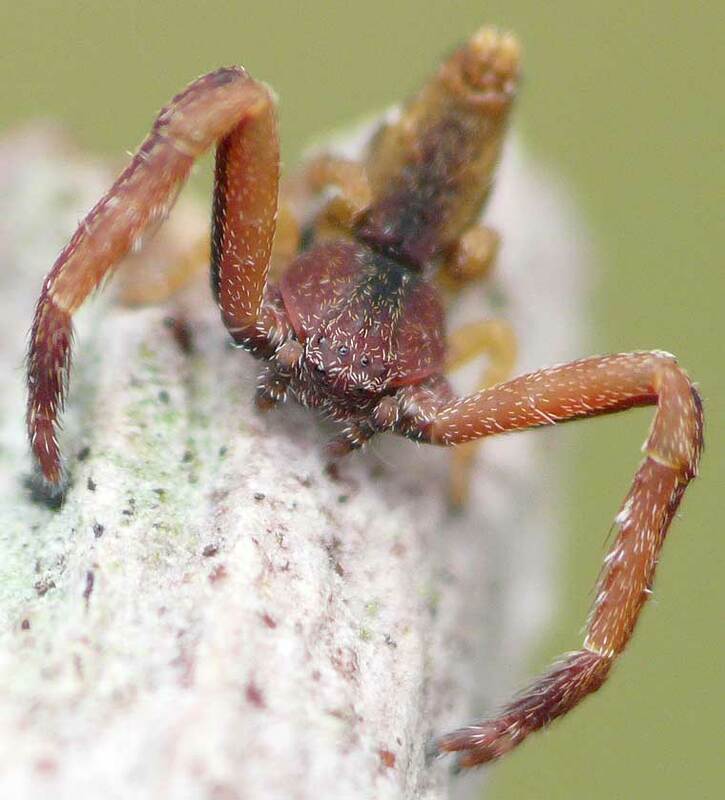 Knobbly Crab Spider is a slow moving, relatively timid spider that relies on its camouflage against bark to avoid predators and to hide when waiting for prey. Females up to 10mm body length, males smaller but similar. 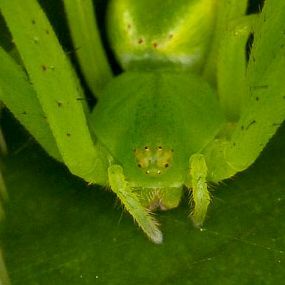 Hawkeswood notes that the mature spiders mostly feed on other spiders. A common but rarely seen Stephanopis because it is so well camouflaged especially against darker barks. A medium sized crab, mostly grey spider with a fat, rather smooth abdomen, and a strongly two-pointed face. Females to about 9mm, males to about 4mm. A small to medium Tharpyna with some similarities to Diaea cruentata. Females to 6mm, males to 4mm. Found on wildflowers on Stradbroke Island near Blue Lake. 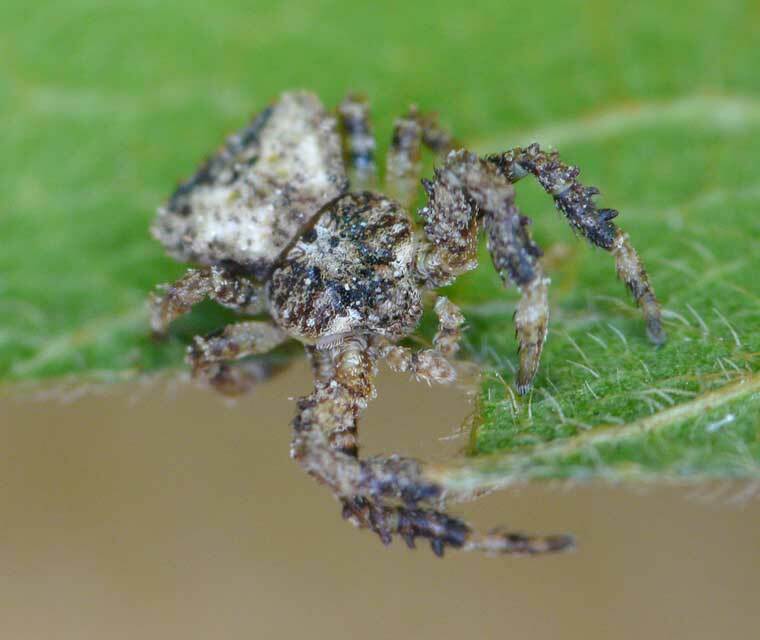 A Thomisid resembling Thomisus spectabilis but grey and distinctive as a separate spider.